I must admit I knew very little coming into the Grand Slam poetry competition in Music House on Saturday, Nov. 19. I’d been to several slams in my time at Wesleyan, but always as an audience member. 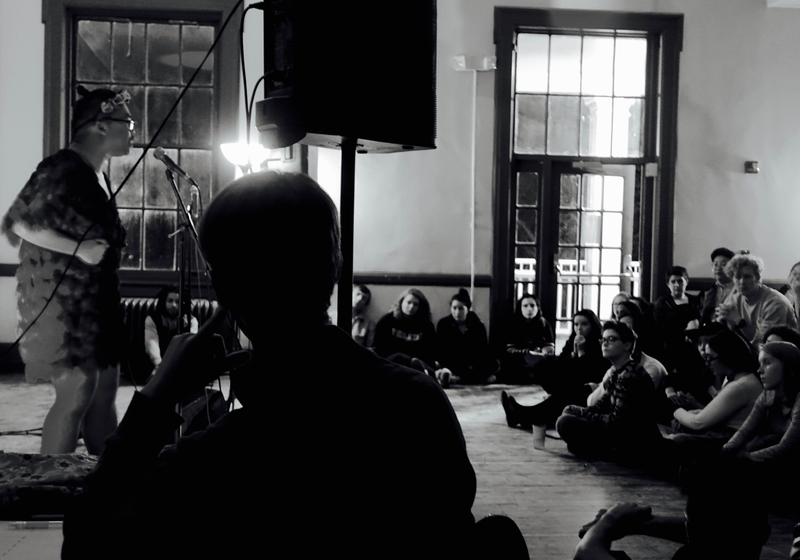 With the kind folks of Wesleyan’s slam poetry collective, WeSlam’s, permission, I was allowed the opportunity to photograph and become all the more acquainted with such an intimate atmosphere. I want to acknowledge my role as both an observer and as a writer coming from a place of privilege, not only from my circumstances in life, but also from the kind treatment and access I was allowed in documenting such a powerful and moving event intended to provide space for marginalized voices to be heard. After two prior poetry slams this past fall, students packed into Music House for “On Resurrection: The Grand Slam Poetry Slam ft. Paul Tran.” The competing poets that night were as follows: Arnaav Bhavanani ’20, Ahmed Badr ’20, Ariel Edelman ’20, Mina Khan ’20, Lili Kadets ’17, Lexi Slater ’19, Hazem Fahmy ’17, Dylan Moore ’20, Clara Babbott-Ward ’20, and Isaac Klimasmith ’20. Of the largely freshman group of 10 performing poets, only seven made it into the night’s second round, and in the end only 5 finalists were picked to represent Wesleyan in the College Unions Poetry Slam Invitational (CUPSI), an intercollegiate poetry slam competition occurring in Chicago from April 12 to 15 of 2017. For those unfamiliar with the rules of slamming, each poet is allotted 3:10 seconds per round. If poets go over their time limit, a penalty is tacked onto their final score. Five judges are picked at random from the crowd before the slam begins. These judges then rank each performance on a scale of 1 to 10. Throughout the nearly three-hour event, all the competing poets sat in the audience and watched their potential teammates perform to the clicks of snapping fingers and a frequent roaring applause. Though staged as a competition, the event appeared to be so much more than that, as competing poets were often the loudest voices in the room cheering out and encouraging their fellow performers as they told their stories. Lit by the backdrop of purple and blue stage lights, poets slammed during both rounds on a wide array of topics: the recent U.S. election; the U.S. war in Iraq; political oppression, both abroad and in the U.S; diasporic struggles like assimilation and immigration; heartbreak and critiques of relationships; body image issues; and issues relating to sexual orientation and gender identity. In between the first and second round, guest poet Paul Tran slammed and discussed their personal history with the art form. 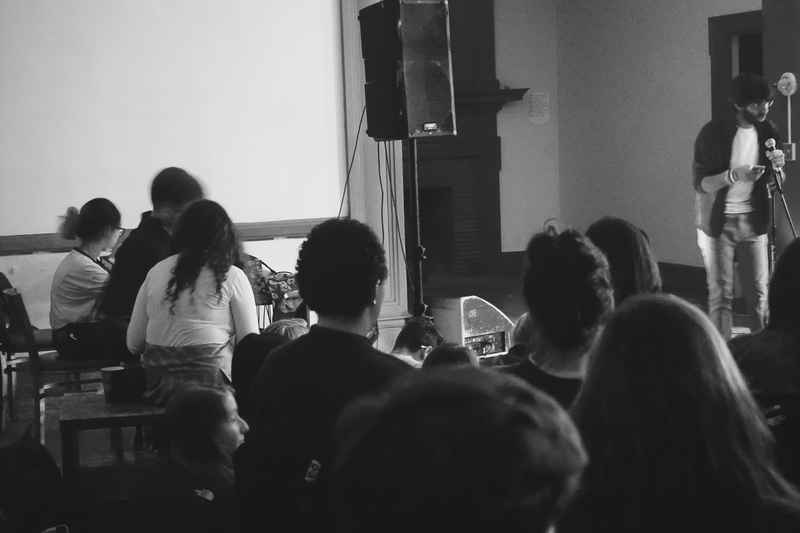 Tran discussed their beginnings with slam poetry as a first-generation college student at Brown University. They then explained how they came to find poetry as a vital medium for self expression after they were sexually assaulted in their junior year. They are currently working on a collection of poems detailing intergenerational trauma, sexual violence, and U.S. colonial power over Saigon in the post-Vietnam War era. They write from personal experience as the child of refugees from Vietnam. Tran captivated the audience when slamming, pouring out a wide range of emotions and flows. In between performances, Tran opened the room up to an interactive discussion with the audience. They explained why they made space for a Q&A session. During this discussion, many students were able to both approach the poet with thoughts on their work and discuss how Tran works within the art form. “How do you understand and navigate your identity as a non-black person of color when slamming with respect to blackness, an identity which is cemented in slam culture?” Sahil Singhvi ’18 asked during the Q&A. Tran also discussed how the sentiments of slam can move beyond competitions and into contestants’ and audience members’ everyday lives. Finalists Ahmed Badr, Ariel Edelman, Mina Khan, Lili Kadets, Lexi Slater, and Hazem Fahmy will make their way to Chicago this coming April to represent Wesleyan at CUPSI. Funding for the event was provided by the College of East Asian Studies, English Department, American Studies Department, and the College of the Americas. Emmet Teran can be reached at eteran@wesleyan.edu and on Twitter @ETeranosaurus.